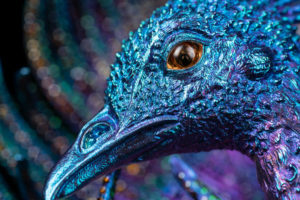 The European Fine Art Foundation was established in 1988 and currently runs three international fairs of fine art, antiques and design throughout the year. 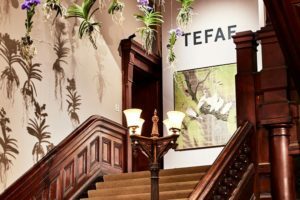 TEFAF New York Spring focuses on modern and contemporary art and design whilst TEFAF New York Fall is all about fine and decorative art up to 1920. 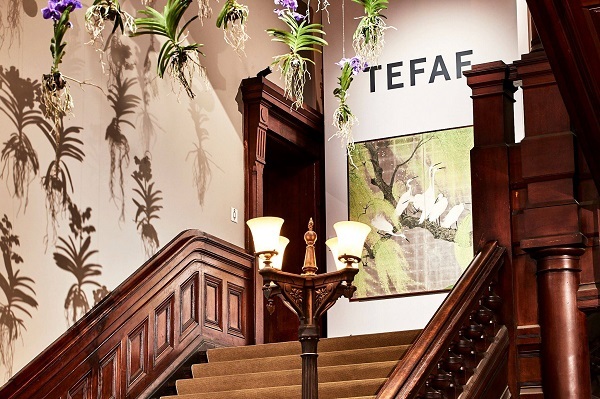 This year’s TEFAF Maastricht (16 – 24th March) which covers over 7000 years of art history and it was truly magnificent. This year was the 32nd year and with 276 exhibitors, as always, it didn’t disappoint. This year’s fair includes items from some of the world’s finest modern jewellers including Wallace Chan, Cindy Chao, Glenn Spiro, Hemmerle and Otto Jakob, alongside examples of antiques from dealers such as London’s Wartski, Symbolic & Chase and Hancocks amongst many others. 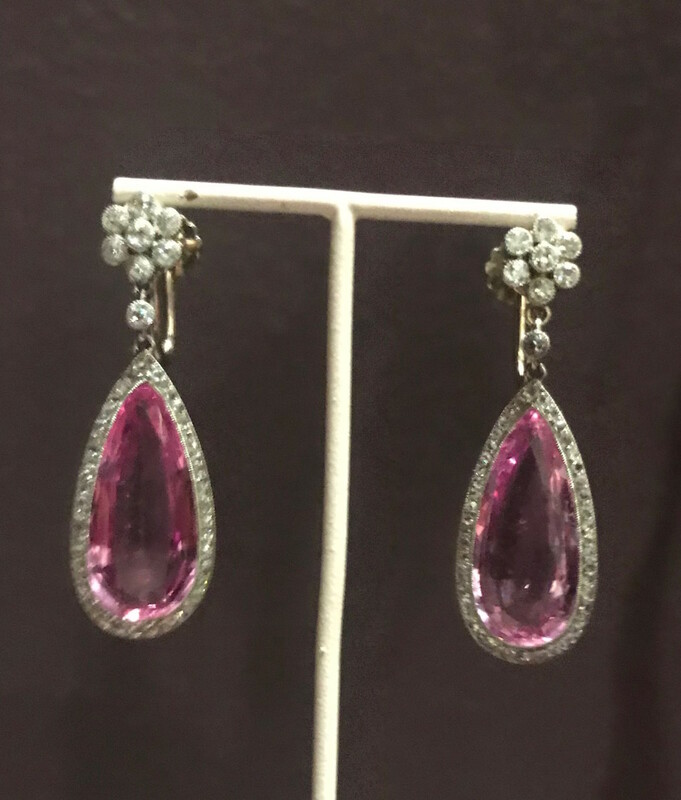 TEFAF Maastricht has to be one of the greatest highlights in the jewellery calendar and definitely worth a visit. 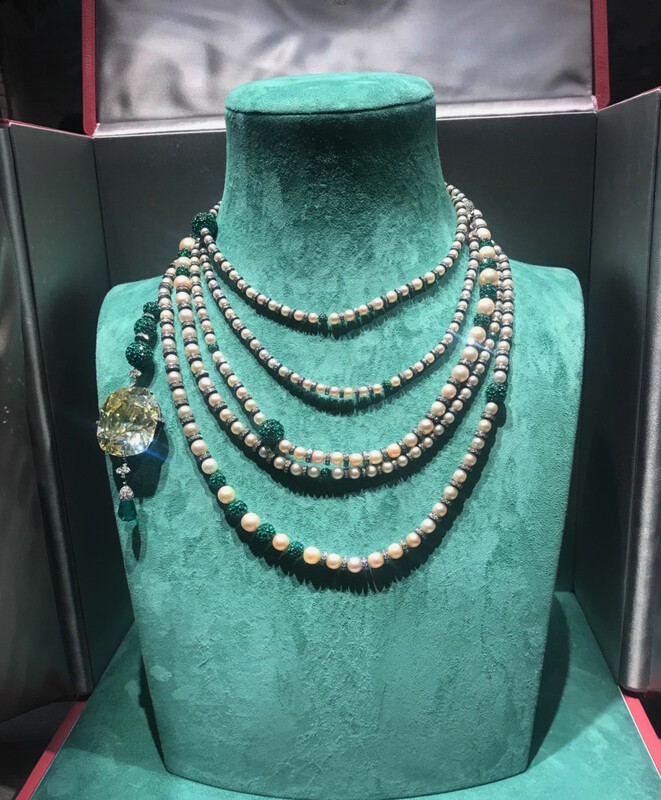 This magnificent necklace is designed as one long strand of natural pearls, beautifully set between rondels which are accented with single cut diamonds and circular cut emerald set spheres. 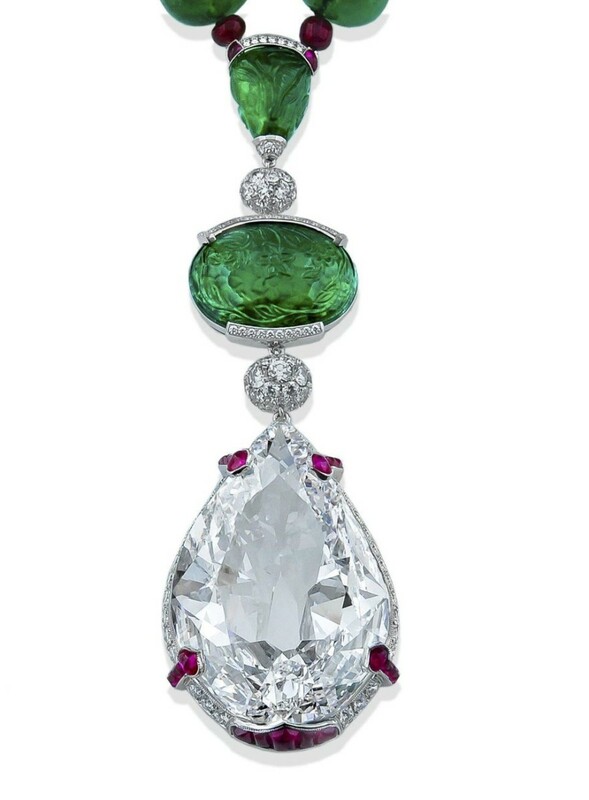 On the end is a 19th Century cut 114.63 carat vivid yellow diamond with a Columbian emerald drop. Made by the renowned fine jewellery designer, JAR. 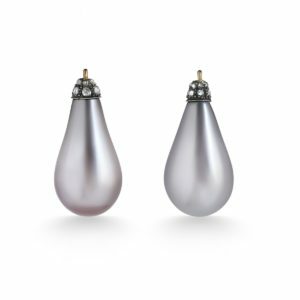 Founded in 1978 in Paris by Joel Arthur Rosenthal, JAR creates less than 100 pieces each year using only the finest quality gems with meticulous attention to detail. 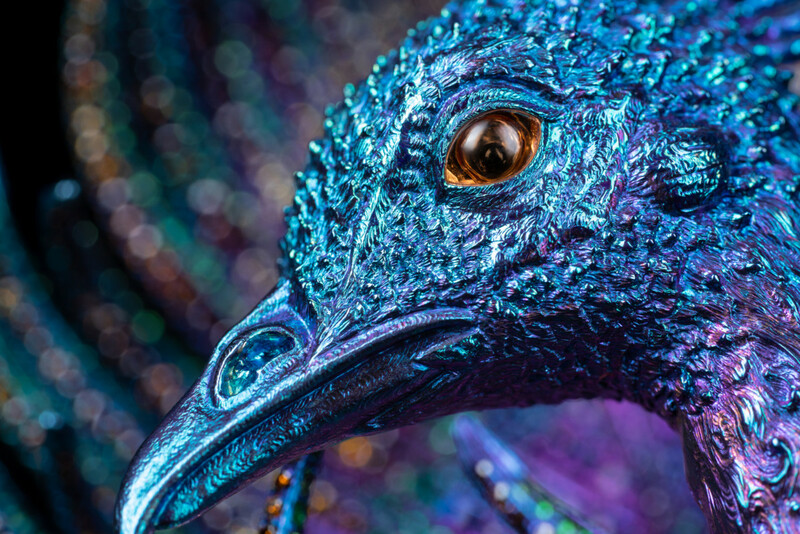 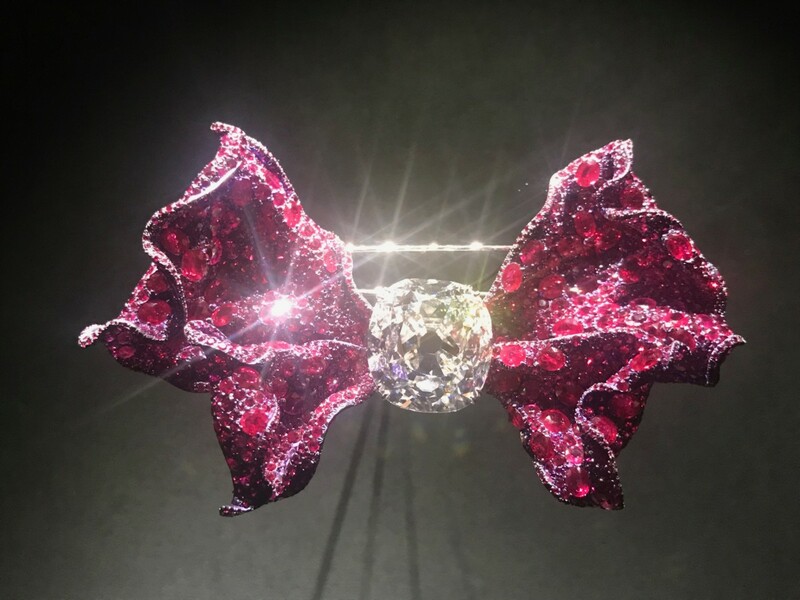 He has been called “the Faberge of our time” by Christies and it is clear to see why. 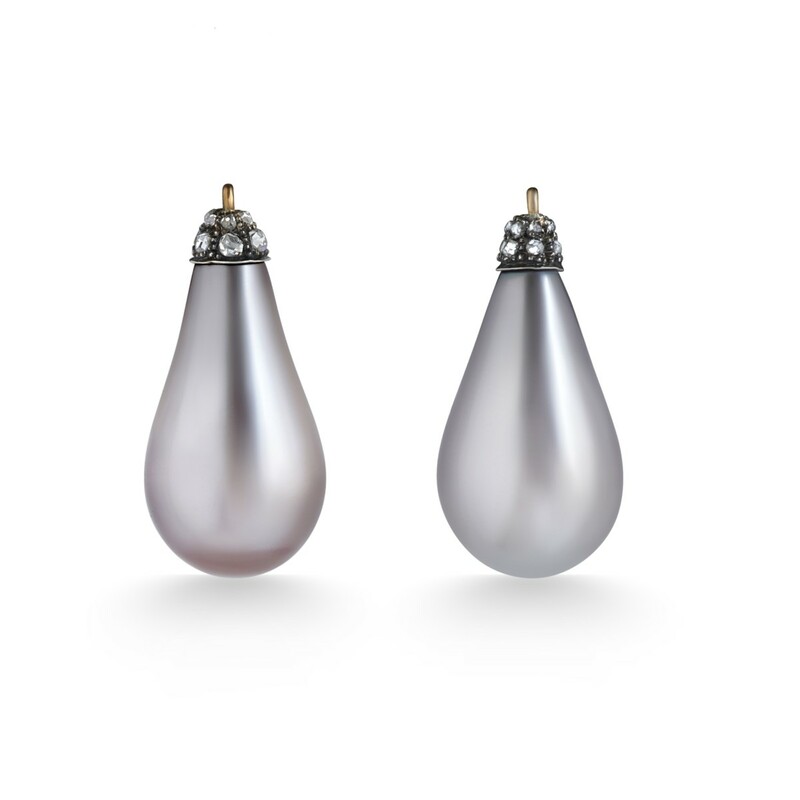 Absolutely one of our favourite pieces must be the natural pearl and diamond earrings from Symbolic & Chase. With two natural grey drop shaped pearls with pink and brown overtones, topped with rose cut diamond caps in silver and gold, these earrings are not only beautiful but hold such history too. 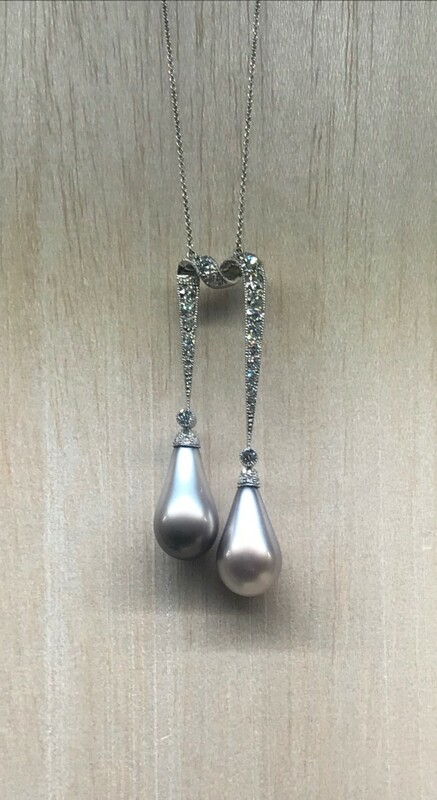 They come accompanied with a lovely handwritten letter detailing their travels through ownership since the 19th Century, as well as an SSEF report with accompanying appendix letter which states “matching pair of natural pearls of this size and quality is very rare and exceptional, and thus this pair of pearls can be considered a very exceptional treasure of nature”. 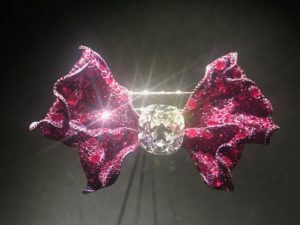 Set with an old mine cut, cushion-shaped diamond of 76.91 carats and rubies totaling a staggering 110.54 carats, the bowtie brooch from Cindy Chao’s Ribbon collection is simply dazzling! The Nizam diamond was the most famous sparkler in the 1800s. An exquisite tear-shaped Golconda diamond of more than 120 carats. 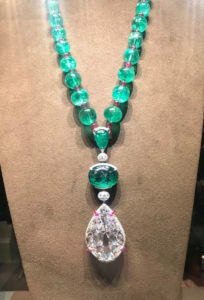 This famous and historic diamond got its name from the Prince Nizam of Hyderabad, and is said to have found at Kollur Mine. 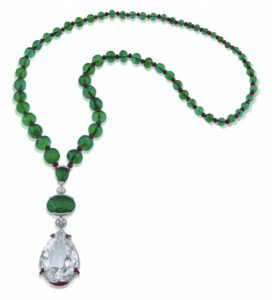 The rare treasure is set in an exquisite Art Deco style, Moghul-inspired necklace of emeralds and rubies by Siegelson of New York. 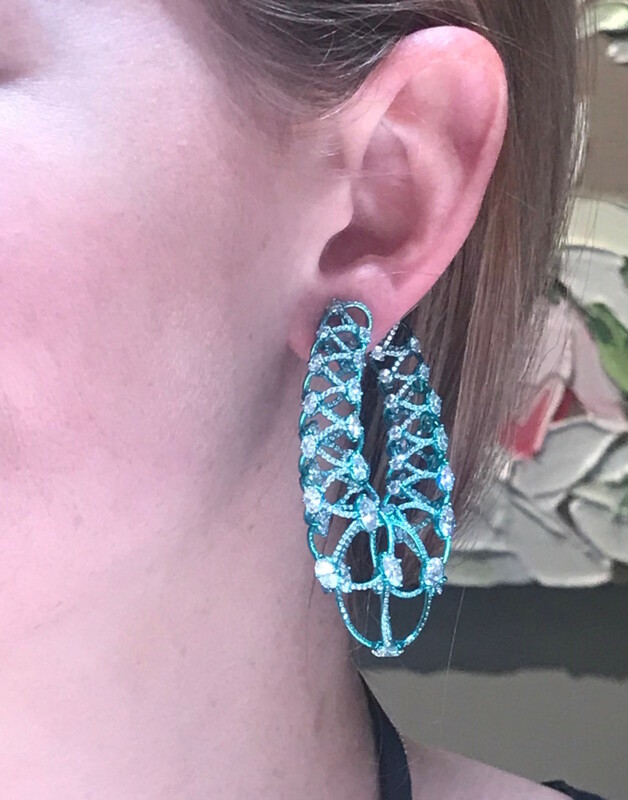 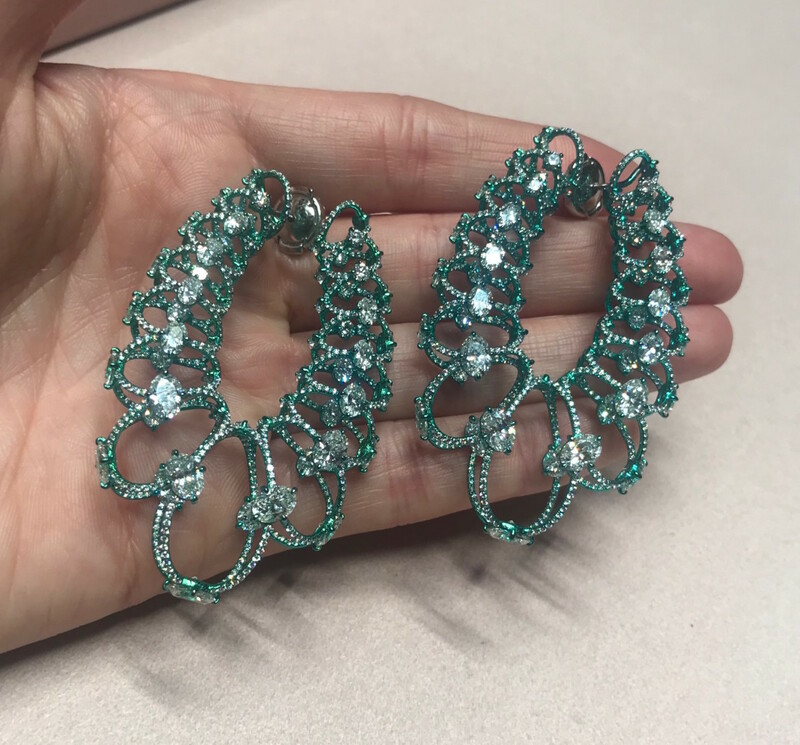 From the designer of the world famous ‘Papillion ring’, these fantastic statement earrings by Glenn Spiro are set in green titanium with beautiful sparkling diamonds. We loved the design of these earrings and being made from titanium, they are incredibly light too! 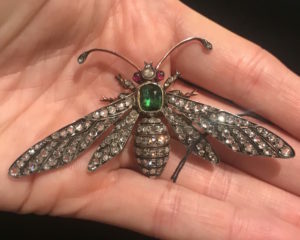 At the A La Vieille Russie stand, we found this marvelous antique diamond and emerald wasp brooch by Fontana. 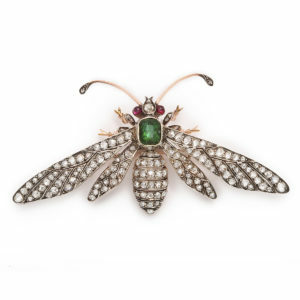 With diamond set wings and antennae, an emerald set body and ruby eyes, this gorgeous brooch is one not to miss! 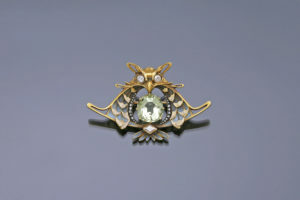 Possibly one of the most amazing pieces this year is the convertible Hera brooch ring by Wallace Chan. 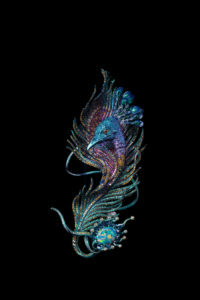 It is one of four of Chan’s newest creations made using his latest innovation, ‘The Wallace Chan Porcelain’, a groundbreaking new material which is five times stronger than steel. This piece was our favourite of the four, although they are all spectacular. Hera, the ancient Greek goddess of marriage is represented here as a wearable form of self-expression. 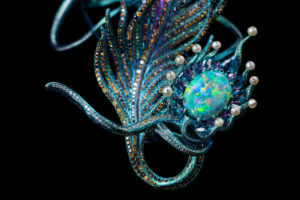 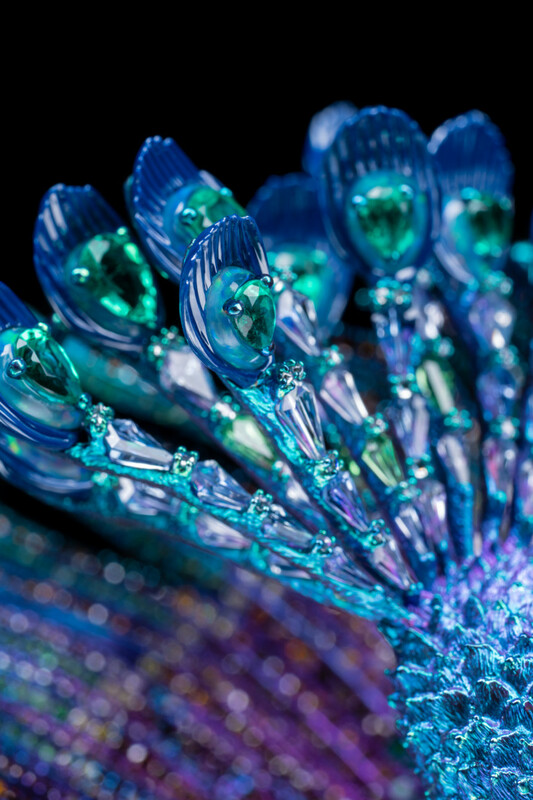 Wallace Chan spent four years hand-picking each of the thousands of gemstones. 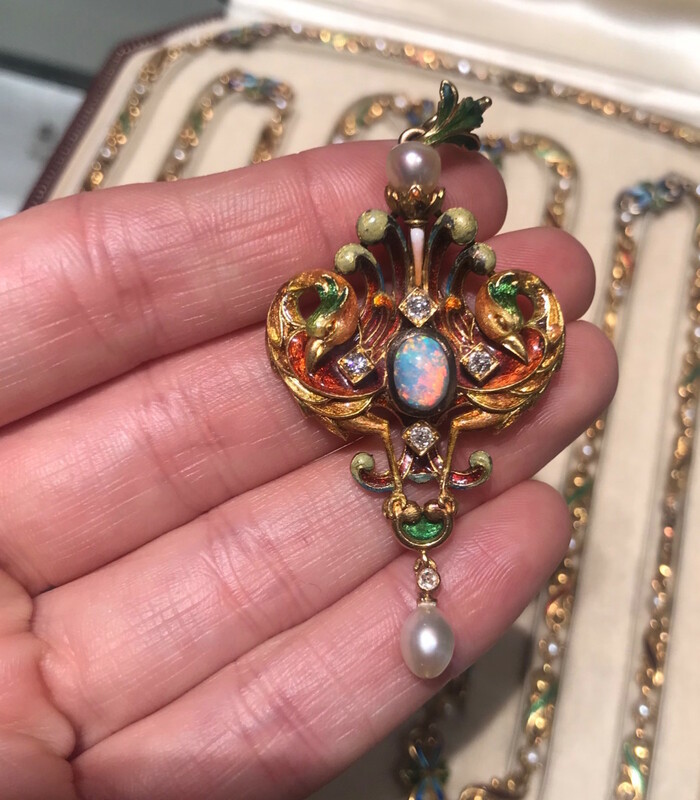 Set with a 14.61ct black opal, 1.21ct of padparadscha sapphires, fancy coloured diamonds, fancy sapphires, tsavorite garnet, emerald, aquamarine, pearl, opal and lapis lazuli. Encircling its diamond-paved body is a black opal ring. 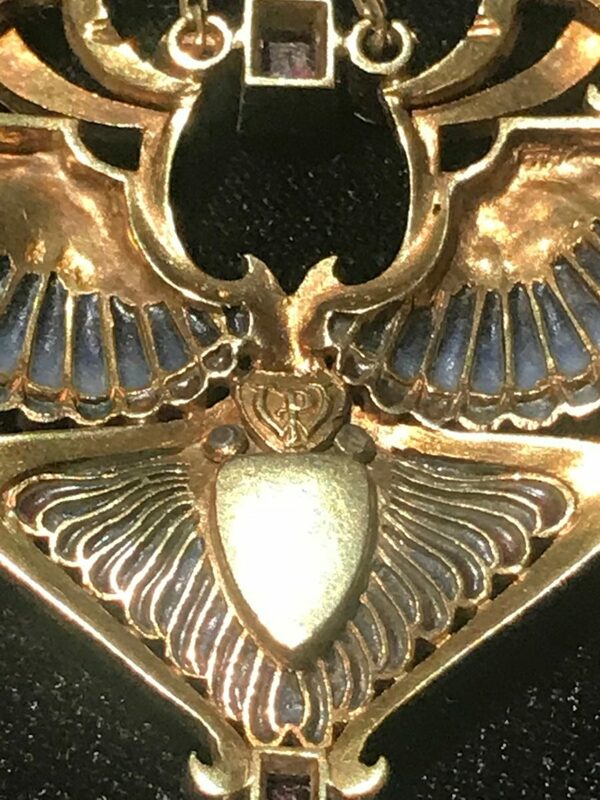 Signed by Michael Fenie and circa 1625. It is an unusually large watch with day, date, ages & phases of the moon and is set in silver and gilt metal. 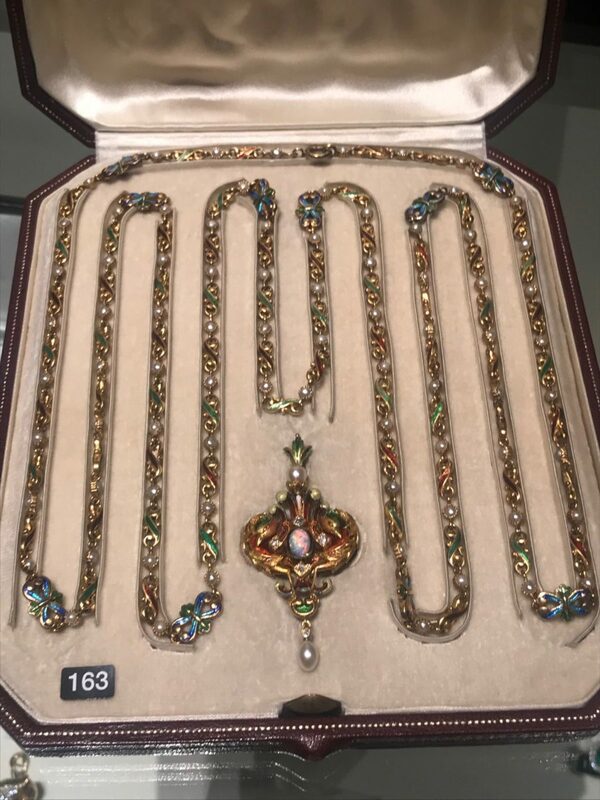 The detail on the case speaks for itself. 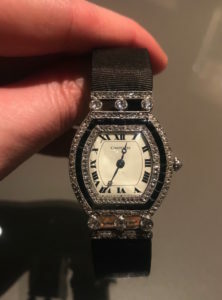 Cartier diamond cocktail watch. This rare platinum, diamond and onyx set cocktail watch is simply stunning. 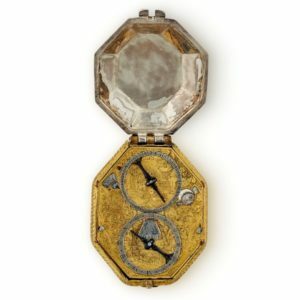 The beautiful white dial has Roman numerals with blue steel hands and an inner minute track. 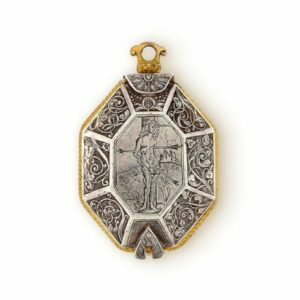 Among the many beautiful pieces from Hancocks London was this wonderfully bold Vintage Andrew Grima pendant watch necklace. 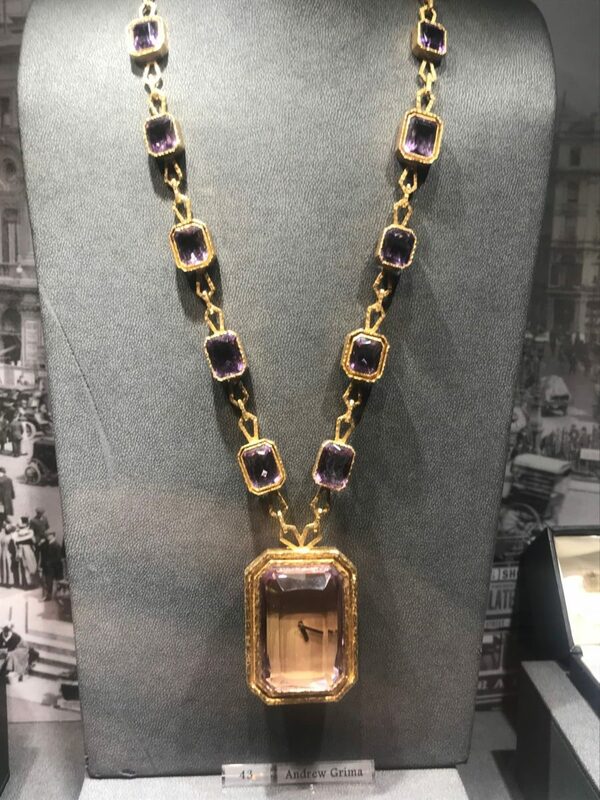 Set with amethysts in 18ct yellow gold on a long chain it really is quite striking. 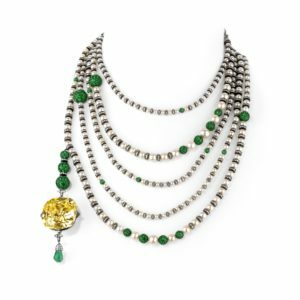 Epoque Fine Jewels specialize in the finest 19th and 20th century Jewellery, with emphasis on the Art Nouveau and Art Deco periods. 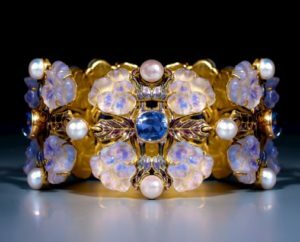 This magnificent Art Nouveau, Lalique ‘Pansy’ bracelet is made from sapphire, enamel, pearl and glass all beautifully finished in gold and really is a sight to behold. Another fantastic piece from Epoque Fine Jewels – this Art Nouveau gold, enamel, opal, ruby and diamond ‘Nike’ pendant by Philippe Wolfers. Centered upon a carved opal face of a woman which is then surrounded by purple and orange plique a jour enamel tresses. 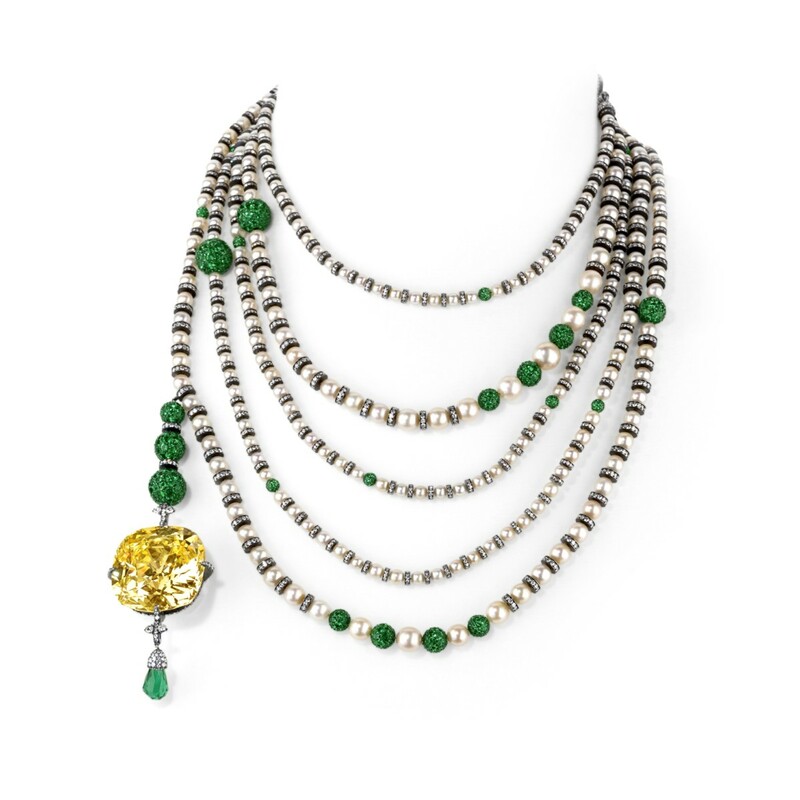 All set in 18ct yellow gold, this pendant would make a fantastic statement piece. This wonderful pendant from Wartski is set with a central shimmering opal, beautifully surrounded by two enameled birds and finished with lustrous pearls to the top and bottom of the pendant. 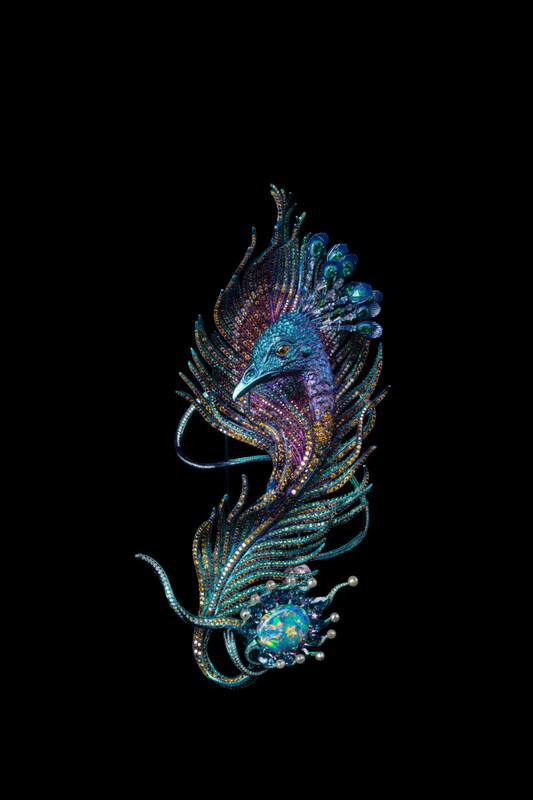 A truly magnificent work of art. 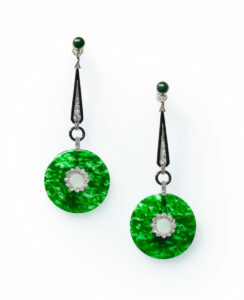 A wonderful pair of Art Deco jadeite earrings set in platinum and beautifully accented by black enamel. 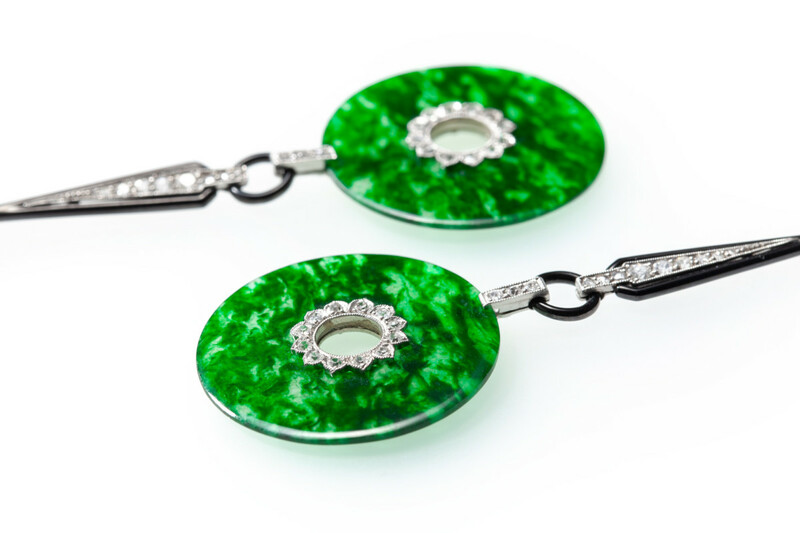 These earrings were made in France c.1920 and the vivid green of the jadeite is breathtaking. Marjan Sterk – Pink Topaz Earrings by J.E Caldwell & Co.
A fine pair of Belle Epoque pink topaz and diamond ear pendants. 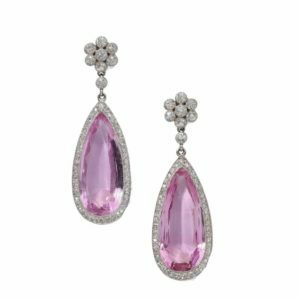 Each designed as a pear-shaped pink topaz drop, weighing approximately 5.50 carats each, suspended from a millegrain-set old-cut diamond, to a similarly-set diamond flower head surmount. 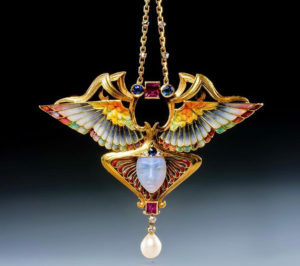 Signed J. E. Caldwell & Co. Circa 1910. 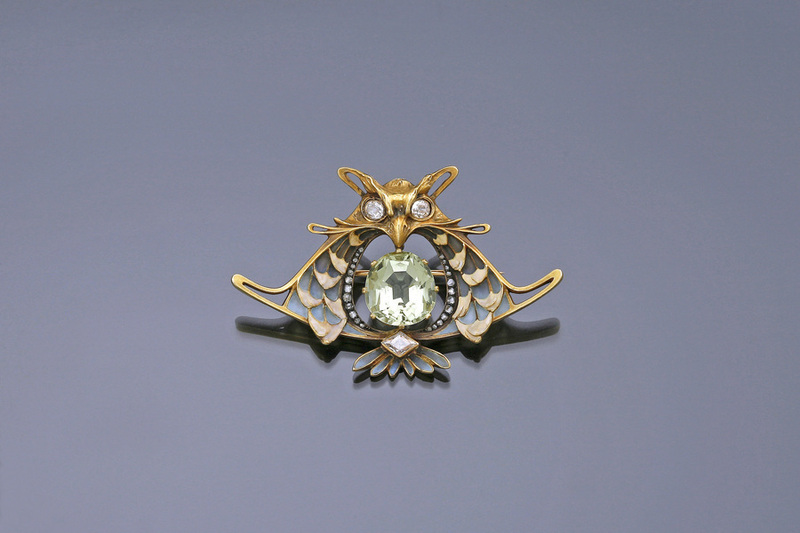 Made by French goldsmith Leopold Gautrait, this Art Nouveau owl brooch can also be used as a pendant. It features a stunning 11 carat mixed cut light green beryl as its body, approximately 0.65ct of old mine cut and kite shaped diamonds as well as numerous rose cut diamonds. 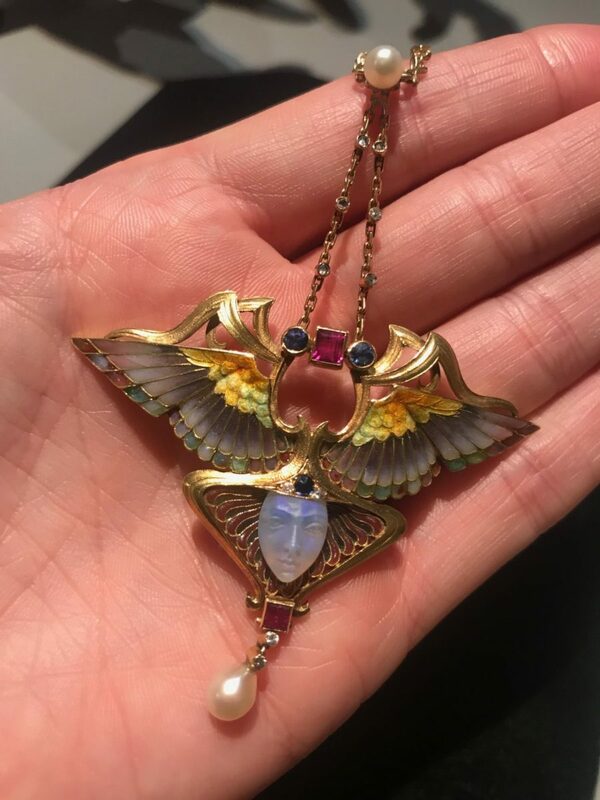 With gorgeous blue-grey plique a jour enamel wings which are highlighted by opaque beige enamel accents, all set in 18ct yellow gold. This wonderfully elegant brooch is one of the only three known examples of this brooch, each of which were made in a different colour and with different stones.